NYPD officers stopped every Q52 and Q53 bus Wednesday morning as they entered Broad Channel to sweep them for students. BROAD CHANNEL — They washed out. 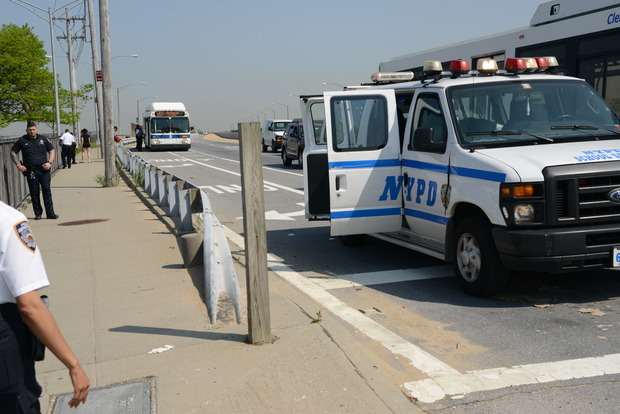 Students playing hooky from class to catch a city bus to Rockaway Beach were shut down by NYPD truancy officers who set up a dragnet Wednesday morning at the foot of the Joseph P. Addabbo Bridge, which connects Howard Beach and Broad Channel. At least seven NYPD school safety vans were lined up in the parking lot at the foot of the bridge, along with several NYPD cars, to snare the scofflaw students, according to officials at the scene. Officers stopped every Q52 and Q53 bus Wednesday morning — which ride from Elmhurst and Woodside and stop in Rockaway Beach — to sweep for hooky-playing students. "They don't belong at the beach, they should be in school," said an official at the scene, citing the Department of Education's truancy rule. NYPD officials confirmed they carried out a truancy initiative in Patrol Borough Queens South Wednesday. "Students that are picked up are either taken to their school if the school is located nearby or they are taken to one of five truancy intake sites throughout the city. From those truancy locations the students are returned to their school," NYPD officials said. It was not immediately clear how many students were picked up, but DNAinfo New York witnessed at least seven students taken off of vans and put into the school safety vans by 10 a.m. The Department of Education deferred a request to comment to the NYPD. Their official policy notes that "consistent attendance is critical for the continuity of instruction" and there are more than 350 attendance teachers across the city. Temperatures were expected to reach 85 degrees Wednesday. City beaches officially open for the season on Saturday.